Whenever mold is found, some people will become anxious and panicked. There are many stories about the rare types of mold known to cause health issues. A mold remediation company can find out which mold is present. However, mold is mold and needs to be dealt with in the same manner. Most molds are not harmful to anyone. They do cause a bad smell, and it will eventually erode whatever it is attached to. 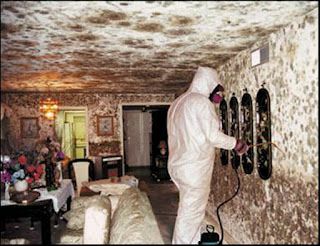 Mold specialists will have the appropriate equipment to remove this fungal parasite safely, rapidly and efficiently. Mold removal does work well when done by someone with the right tools and knowledge. Mold can be found anywhere, but typically this is found in moist areas with low fresh air flow. Most of the time, mold will be in basements, attics, crawlspaces and perhaps in the bathroom. The mold experts will bring heavy plastic sheets to keep everything contained in one area. As they begin to sand or blast off the surface mold, there will be airborne mold particles that could eventually contaminate again. The mold specialists will have powerful fans and protective body apparel to lessen risk of cross contamination. Obviously, if there was a problem that caused the mold growth, that problem needs to be addressed promptly or the mold could again take hold. A highly trained mold remediation expert can determine what caused the mold outbreak. Usually it stems from a moisture problem. If in attic, the roof and all connecting structures should be investigated. Sometimes it happens when an air filter is clogged, or when there is a leaky pipe behind the wall. Whatever the cause, the mold remediation team at DKI Services will be on the lookout for appropriate repair options. There are varying ways to remove mold. When home or business owners try to eliminate the mold with harsh chemicals, it often does not work. This method is typically done on a very small mold area. Using just chemicals does not really allow for appropriate removal of the fungus. Mold remediation services offer other methods that are non-toxic, safe and able to rid the area of all mold. They do this with vapor or sand blasting of the mold area. Some specialists prefer corn cob or dry iced blasting instead. After this process is complete, the mold professionals will clean the entire work area with special filtered vacuums able to catch even minute objects. Property owners should seriously consider another great mold remediation service. These companies will often seal the structures where the mold was growing. This is done to keep out further mold and mildew issues. It also protects those structures from any moisture issues that might arise. Property owners can take advantage of this protective sealant by contacting a mold remediation company. The experts can inspect areas not easily accessed. They will do a mold and moisture inspection that is a fantastic idea for those property owners that want to sell. DKI Services offers many benefits. They are experts in all sorts of property damage that includes any structures. This company is well-trained to handle even tricky mold situations. They are able to resolve mold problems fast, and offer up any further damage control or prevention measures.